There are a number of coins mentioned in the Bible, including the denarius, the lepton (widow’s mite), and the shekel. While the nicer coins are marked at a premium, many are common coins and can be purchased for a few hundred dollars. For instance, there are hundreds of thousands of authentic widow’s mite coins from 2,000 years ago; in fact, an authentic coin referred to by Jesus in Luke 21:2 can be purchased for just a few dollars in a coin shop or on the Internet. Some have criticized the Mormon Church for its failure to provide evidence for any Nephite coins. But should we really expect the LDS Church to produce them? Coinage in the Western Hemisphere during the Book of Mormon time period was unknown. The use of coins did not become popular until the sixteenth century, more than a millennium after the last Nephite had allegedly died. However, the problem does not lie in a lack of Nephite coins. Rather, it lies in Joseph Smith’s implication that such coins existed in the first place. The description certainly sounds like coinage, which is how it was traditionally interpreted by Mormon general authorities. In fact, until changes were made to the Book of Mormon headings in 2013 (described in more detail below), the introduction to Alma chapter 11 stated that the descriptions of the money were “Nephite coins and measures.” This explanation was given by James Talmage, a Mormon apostle who was commissioned to add both chapter headings and footnotes to the Book of Mormon. James P. Harris, author of The Essential James E. Talmage, noted that Talmage “was customarily meticulous, making sure there were no errors or omissions” (p.xxix). Based on Talmage’s description, we have wondered why, in so many biblical ruins uncovered in the Middle East, archaeologists have been able to date their findings by the pottery and numerous coins normally found in the same level of their dig. Yet nobody has been able to find anything that would indicate a measurement of a precious metal or a coin that would connect them with ancient Israelites in the Americas. “In addition to these words we have also a number of names of Nephite coins and the names of fractional values of coins…” Roberts proceeds to explain the different values, often using the term “coins” to describe them. Though Roberts says “we have no means of obtaining specifically the value of these coins in modern terms,” he adds that “there is stated a system of relative values in these coins that bears evidence of its being genuine” (A New Witness for God, 3:145). Mormon apologist Michael Griffith agreed when he said, “Nowhere in the Book of Mormon is the use of coins even mentioned. The term ‘coins’ in the chapter heading to Alma 11 is a mistake of modern editing, not a part of the original text itself” (Refuting the Critics, p. 60). Peterson and Griffith’s analysis seemed to understand how damaging it would be if Alma had been referring to actual coins. Commonly used coins in any culture always have a way of showing up. They don’t just disappear entirely from the face of the earth. As Peterson and Griffith explained, there were no coins, and thus not finding examples of Nephite coins is not problematic. We disagree with Dr. Peterson’s claim that no variant of the word coin is used in the text. Taking his advice that Noah Webster’s 1828 American Dictionary of the English Language is perhaps “our best source for the language of Joseph Smith and his contemporaries” (Review of Books on the Book of Mormon, 5:8), there are several definitions found under the word “piece” (the word Smith used in Alma 11:4). What’s interesting is that none of them have any meaning that would fit Alma 11:4 until the eighth definition: “A coin; as a piece of eight.” The meaning for “piece” in Joseph Smith’s day was “coin.” This shows that “coin” was interpreted not only by James Talmage but the “translator” of the Book of Mormon himself! This rule was followed in the 1979 Book of Mormon Student Manual – Religion 121-122 when a subheading asked students “How Valuable Were the Nephite Pieces of Money?” Showing that “pieces” meant “coins,” the manual presents a chart to show “the relative value of silver and gold coins under the system set up by Mosiah” (p.229). Yet, as we have modified this article in May 2013, we noted above that the LDS Church is changing many chapter headings throughout the Book of Mormon originally written by Talmage. In one full swoop, the Mormon leaders appear to be disavowing any connection with coinage. Does eliminating the word “coins” from the Book of Mormon heading mean that Alma 11 was not referring to coins? For all intents and purposes, Alma 11 certainly appears to be a monetary system based on gold and silver, with a standarized weight and a chart explaining the worth of each piece, such as a day’s wage worth “a senine of gold” or a “senus of silver, which is equal to a senine of gold.” This certainly has the look of coins, perhaps even melted into specific shapes to be called a specific name (i.e. senine and senus). For all intents and purposes, we have the picture of coinage. Even if Alma 11 is not referring to coins, the Mormon apologists still has a problem. After all, Native American economies dealt with trade and agriculture, not precious metals. For example, Michael D. Coe explained how the Mayans used quetzal feathers obsidian, jade, cocoa beans, and other agricultural items for their barter, not gold and silver (The Maya, 2005, p. 206). In the spring of 2013, the LDS Church decided to make a number of changes to chapter headings originally written by Apostle Talmage and published in the 1920 edition of the Book of Mormon. Gone is the mention of “Nephite coins” in the heading of Alma 11. New editions now say, “The Nephite monetary system is set forth.” Ignoring past statements from their predecessors, current Mormon leaders appear to be disavowing any direct mention of Nephite coinage, perhaps washing their proverbial hands of the embarrassment that comes with lack of archaeological support for the Book of Mormon. Does this change mean that “coins” were not meant, as the LDS apologists quoted above want us to think? The new heading leaves no doubt that the writer of Alma 11 was referring to a monetary system, and according to the text, this system was based on gold and silver. The text includes a standarized weight system with examples of daily wages and the worth of each piece. For example, a day’s wage was worth “a senine of gold” or a “senus of silver” is “equal to a senine of gold.” The impression given is that these metals were melted into specific shapes so they could be called specific names (i.e. a senine and a senus). An objective reader of Alma 11 comes away with the same impression that James Talmage and other leaders have had, that these were descriptions of coinage. For the sake of argument, let’s suppose that the LDS apologists are correct and actual coins are not the proper interpretation from Alma 11. Does this solve the problem? Not really, for we know that Native American economies dealt with trade and agriculture, not precious metals. For example, non-Mormon scholar Michael D. Coe explained how the Mayans used quetzal feathers obsidian, jade, cocoa beans, and other agricultural items for their barter, not gold and silver (The Maya, 2005, p. 206). Why, then, does the Book of Mormon refer to precious metals in this economy? Could this be an error made by the “translator” of the Book of Mormon who would not have the information that precious metals–so common in his day–were anachronistic if referring to ancient America before AD 600? 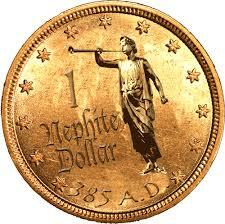 This is because there was no coinage in the Western world during the supposed time of Nephites and Lamanites. The changing of the Alma 11 heading is another example of the Mormon Church sweeping historical problems under the proverbial carpet and wishing the issue away. Perhaps it would have been better if the leadership just left this problem alone, as they had done since the heading was included in the 1920 edition almost a century ago. We take this as an admission that the archaeological evidence goes against the Book of Mormon story upon which the veracity of the LDS religion lies. For more information on the changes in the LDS scriptures, we recommend an article titled “What’s Hidden in the New Headings?” in the May 2013 Salt Lake City Messenger.